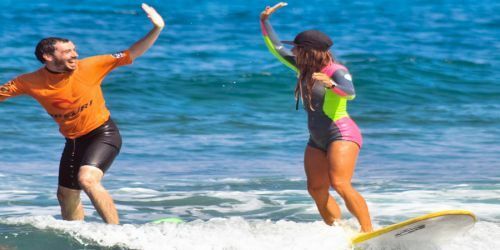 The Tenerife Surf Camp pack is based on accommodation in surf house or private apartment with surf school for all levels. Lessons are in group, with 2 sessions per day, with theoretical part and video analysis. We offer 2 options: ALL INCLUSIVE (with breakfast and dinner) and BASIC (with breakfast only), both include surf equipment rental throughout the week and transfer to / from Tenerife South Airport or bus station of Los Cristianos. Surfcamp airport shuttle: Included in the price of the Surf Camp package, we offer airport / camp return transfer, with private driver .